Happy Easter, friends! As a Catholic, Easter is considered to be the most important holiday of the liturgical year. Without Easter- without the Resurrection of Jesus- there would be no Christian Faith. It’s incredible to think that our entire mindset is wrapped around one day; moreover one occurrence, that happened so many years ago. The Easter season brings with it many traditions that my family (and probably yours) partakes in each year. 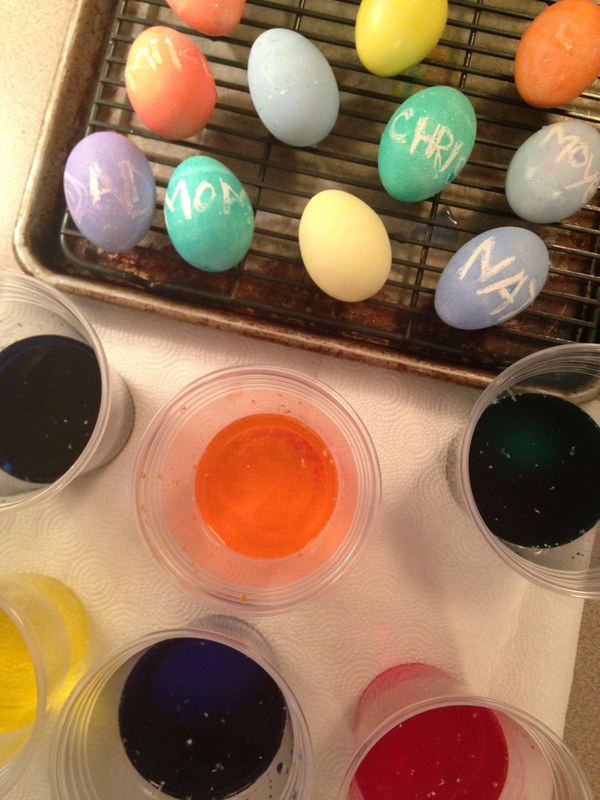 As we were coloring Easter eggs last night, it made me think- why do we do this? “It’s tradition!” is usually the answer. For those looking for a more in depth reason behind the tradition, I am here today to enlighten you! I read up on the subject and here, in my own words, is what I have discovered. Going back in the history of Christianity, eggs (a sign of spring and new life) were dyed red to symbolize the blood of Christ that was shed on the cross at the time of His crucifixion. The cracking of the eggs on Easter Sunday represented Jesus emerging from the tomb. Easter egg hunts have been linked to Mary Magdalene and the other women looking for Jesus on Easter morning, only to be overjoyed in finding that His tomb was empty. Another historical account that I read listed eggs as a forbidden indulgence during the Lenten season. Followers of the faith would paint and decorate the eggs before Easter Sunday, and then eat them to celebrate the end of their fasting. To bring things back to my Italian roots, we have Easter Bread. Throughout Italy, Easter bread making is a popular tradition. The concept of baking whole eggs twisted or braided into bread dough is part of the above mentioned theme of Easter; eggs being a symbol of fertility and new beginnings. 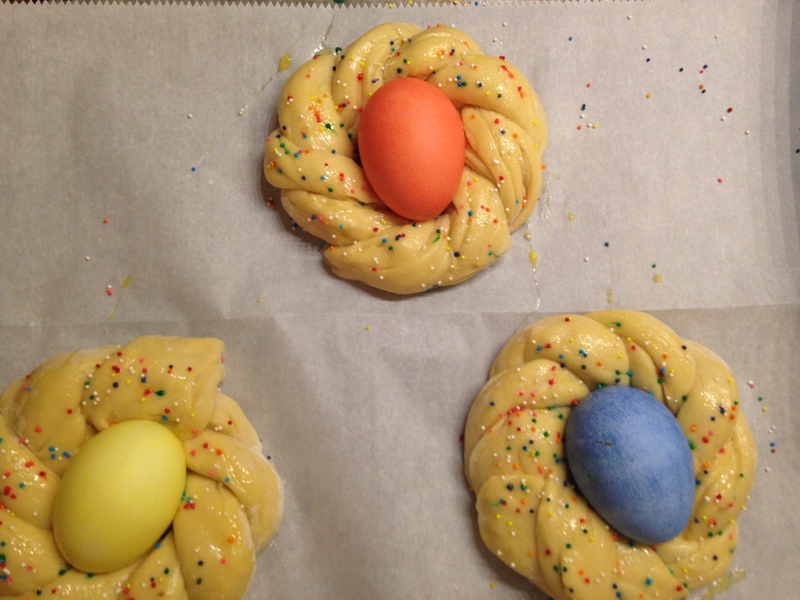 If you are looking to make some Easter Bread today, the recipe that I used can be found on one of my favorite Italian Blogs- http://theitaliandishblog.com/ It is simple and fun to make. Easter Bread is slightly sweet and dense, and is perfect for dipping in your coffee at your afternoon brunch. Buona Pasqua! (Happy Easter!) Mangia! Xo.